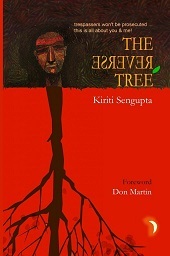 The Reverse Tree is a thin volume of six personal essays by Bengali poet and translator Kiriti Sengupta. There are poems scattered throughout the book, maybe ten or fifteen of them, which serve to enhance the commentary, but to say this is a book of poetry is erroneous. Sengupta tackles simple everyday topics such as Internet use as well heavier ones such as transgender issues and today’s relevance of the Bhagavad Gita, The essays do not connect, nor are they supposed to. The book’s title comes from the idea that a human being is a reverse tree — the roots (brain) is at the top and the branches (limbs) are below. The image is very similar to that of the banyan tree, a very important tree in Hindu scripture. The poems are fun reads, but not necessarily something that stays with you. This may be fine, because they play a supporting role in the collection, and take up very little real estate in the book overall. Sengupta’s style is very informal. He addresses his readers directly, and does not end his essays with any conclusion — the readers are left to take from the essay what they will. It creates almost a dialogue between author and reader, and I get the feeling Sengupta wouldn’t want it any other way. The Reverse Tree is published by Moments Publication, is 48pp, and can be ordered from Amazon.